Lance tells Amy that he hopes he'll see her at the Millennium Party - he can't think of anyone he'd rather see the New Millennium in with. He also tells her that he wants to start the next millennium off "with a bang"
Lyn shouts at Joe for spending on expensive barbecue food for the Millennium party - they can't afford it. Lance dances round the kitch while mopping the floor. He tries to kiss Amy by the sink but she turns away saying she has to go to work. She tells Lance that she might not make it to the party - she doesn't know what's going to happen at work. Lance is disappointed so she says she'll try. He makes her promise to come to the party and she somewhat reluctantly does. Lyn is still going on about Joe's barbecue spending. It turns out that Joe has bought Michelle her new sneakers at all. Lyn is almost apopleptic with rage at this and shouts at Joe that he's spent money that they agreed not to. Michelle comes in and is overjoyed to see the sneakers. Lyn tells her that they're taking them back. Michelle begs Lyn for the sneakers and Joe says maybe there are a few things that Michelle can give him a hand with. Lyn is not pleased. Joe goes off leaving Lyn speechless. Drew is on the phone to his mother saying he will "If the time is right" but finally saying that, "he will". Paul overhears this and tries to probe a bit, but Drew is distracted and says he has to go off for a while. Paul agrees to look after the garage while he's gone. Harold (complete with nose dressing and a cast on his arm) is working behind the counter. Drew comes in to talk to Karl. He wants to talk privately but Karl is just off to the hospital. He says they can talk later. Joel wants his winnings from Lance because he broke first and cleaned the house(!) Anne comes up to help them to set up for the party. They start to set up tables and Lance tells Anne that he's really glad that Amy is coming to the party. Michelle comes round and tells Paul that she doesn't want any lessons today, but they can restart after the Millennium if they all survive(!) Tad scoffs at this and Michelle wanders back home. Susan has been on the phone to Lou - the roads are still impassible so he still can't get back. Drew comes to the door and looks a bit nervous. He asks to borrow some barbecue tools and Karl remembers that Drew wanted to talk to him, and asks him loudly what it was. Susan and Libby overhear this and look up in curiosity. Drew won't be drawn and says he'll talk to him later. Libby asks him to bring an REM CD to the party and Drew jumps a bit because he's so deep in thought about something. He tells Karl that he'll come down to the surgery later. When Drew has gone, all three Kennedys are surprised by Drew's strange behaviour. Toadie comes in and finds the kitchen clean. 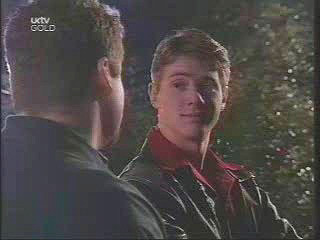 He tells Lance that he hasn't got a date for the Millennium, but that Lance will have a good night with Amy. Lance says, "It's going to be huge!" It's early evening and the party is starting. The guys are drinking their first beer and music is playing. Bill is stroking Bob and exchanges a surreptitious small smile with Anne. Michelle is frustrated that Paul won't dance with her. Steph asks Joe where Lyn is and he says that she's probably inside packing her bags! Flick says that Lyn will get over it. Lyn runs up to Joe and hugs him - the Salon have just rung and she got the job! Lyn is beside herself with joy and Joe and the girls hug her. Michelle is in the treehouse sulking. Joe comes to see what she's up to. He sees several boxes of food there and she says it's "just in case". Joe tells her that the world isn't going to end. He wants to know where she got the food and she says she kept the money from her guitar lesson and returned her new shoes. Joe says that he wouldn't let anything happen to one of his girls - nothing is going to happen. Darkness has fallen and Drew is skulking around the edges of the party trying unsuccessfully to attract Karl's attention. However, Karl is talking to Joe about renovations. Michelle has taken Lolly to the toilet, but she is desperate to get back to the party. Eventually she tells Lolly that she'll be back in a minute and goes. Toadie, Lance, Bill, Anne and Joel are looking for Bob. When the other three go on, Bill grabs Anne's arm and pulls her back. He shows her a couple of sparklers and lights one each for them. They wish each other a Happy New Millennium. Anne says that she always thought about the Millennium - what she'd be doing, who she'd be friends with...a moment comes between them. As they look into each other's eyes, fireworks start. They turn to look at them. Susan tells Karl as they watch the fireworks that she's exactly where she wants to be - with him. They kiss. Bill tells Anne that he loves her and she says that she loves him too. They kiss softly, and then more passionately. Lolly comes out of the toilet and is looking for Michelle. She sees matches and sparklers on the table. 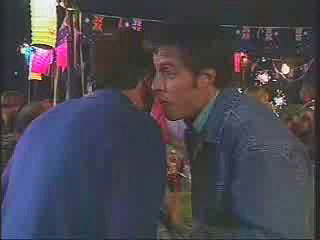 We see shots of the Ramsay Street residents watching the fireworks and then Lolly picking up the matches. She slides a sparkler out of the box. Drew finally gets Karl on one side! He says he wants to ask Karl about him and Libby. But the party is very loud and Karl can't hear him. KARL: Sorry, I can't hear you! DREW: I WANT YOUR PERMISSION TO ASK...(music suddenly dies)...LIBBY TO MARRY ME! Unfortunately the dip in the music means that everyone overhears this, including Libby! LIBBY: (to Susan) Did he just say he wanted to marry me? SUSAN: (shocked) I think so! Drew cringes and Karl drags him away a bit. He says he thinks they're a bit too young and it's a huge commitment. In the meantime, Libby is standing there, stunned and Susan says that maybe Karl will talk him out of it! We cut back to Drew and Karl and who is telling Drew to go for it! He shakes his hand. At that moment Tess runs up in some distress and asks Susan if she can talk to her inside. Drew approaches Libby and Lyn serves them a glass of champagne each. They each take a glass. Lance is looking at his watch and Toadie tells him that Amy will be there. Lance is worried that something has happened. Toadie says Amy loves Lance so much that it makes him sick! Amy's plane has landed and she gets into a taxi. As she does so, a man (Damian) kisses her and gets into the taxi with her. 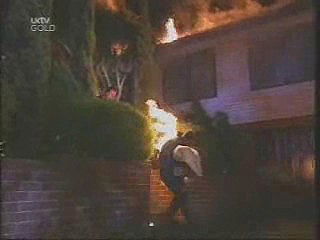 As she does so, we see a shot of Lance continuing to wait for her at Ramsay Street. Drew pulls Libby away from the party. Libby is looking very serious. He says he doesn't care who interrupts them, he's going to say this! DREW: Libby, I know how I feel. And it wouldn't matter if I were forty, I would still feel the same way! I would still want you to be with me! DREW: I have never felt this way about anyone ever before. And I want to spend the rest of my life with you. DREW: Lib, will you marry me? At that moment Karl shouts and we see that the Scully house is on fire! They see Michelle and ask her frantically where Louise is. Michelle tells them in a panic that she's inside the house. Drew and Karl run to the house. Drew runs into the burning building shouting for Louise. The entire kitchen is in flames. Susan gently rubs a cut on Tess's forehead and asks if Brandon hits her. Tess admits that he did and Susan asks her to talk to her about it. At that moment, Anne rushes in to call an ambulance - the fire brigade are already on their way. Susan and Tess are shocked to hear that the Scully house is on fire. Bill and Toadie are unrolling a hose. 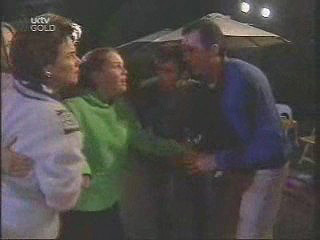 Susan rushes up to Libby and she tells her frantically that Karl's gone round the back, but Drew and Lolly are inside. Joe is trying to open the door and shouting to Lolly to get down on the floor. Inside, Drew, coughing through smoke, spots Lolly lying on the floor. He wraps her in a blanket and picks her up. The fire brigade and ambulance are arriving and Steph and Flick trundle the stretcher across the street. Drew exits the house on fire, still carrying Lolly. KARL: DREW! GIVE ME THE BABY! KARL: DROP AND ROLL, DREW! DROP AND ROLL! 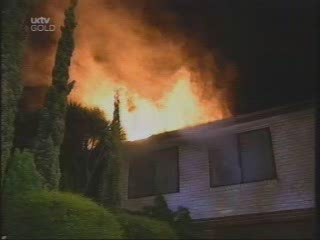 Drew throws himself to the ground and Lance, Toadie and Billy beat out the flames. Meanwhile, Karl is examining Lolly and finds she's still breathing. He shouts to Libby that if any of Drew's clothes are stuck to him, not to take them off. The fire brigade are dousing the fire. Karl looks at Drew's injuries and then gives the details to the ambulance driver. Lyn, Steph, Flick and Michelle are watching their house burn. The ambulance men put Lolly and Drew into the ambulance while Susan and Libby look on in disbelief. Karl goes in the ambulance with them. Libby starts to cry. Joe looks in despair at his burning house and sighs.